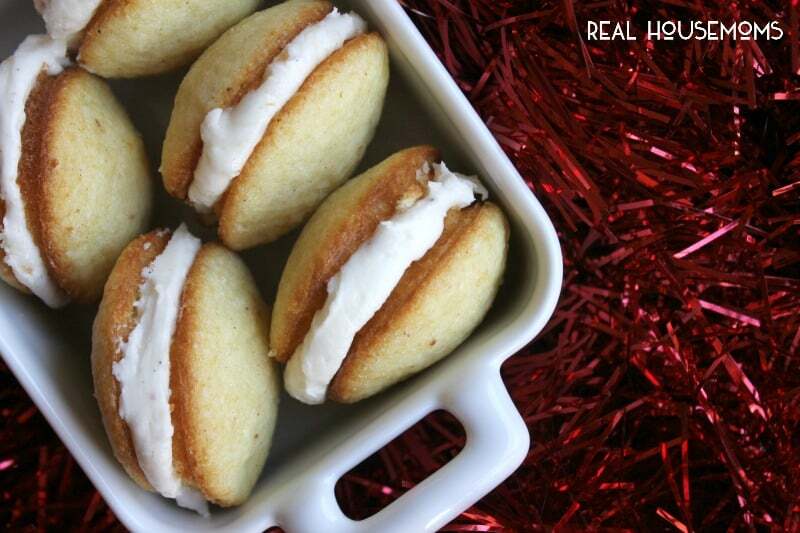 Ring in the holidays with these party perfect MINI EGGNOG WHOOPIE PIES! Eggnog is one of my favorite holiday flavors. 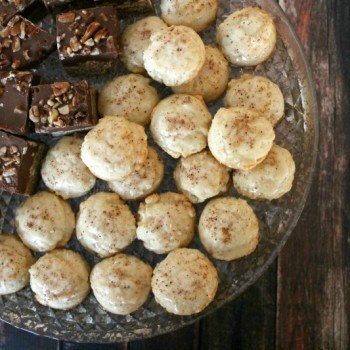 Nutmeg, rum, and cream make the best combination! 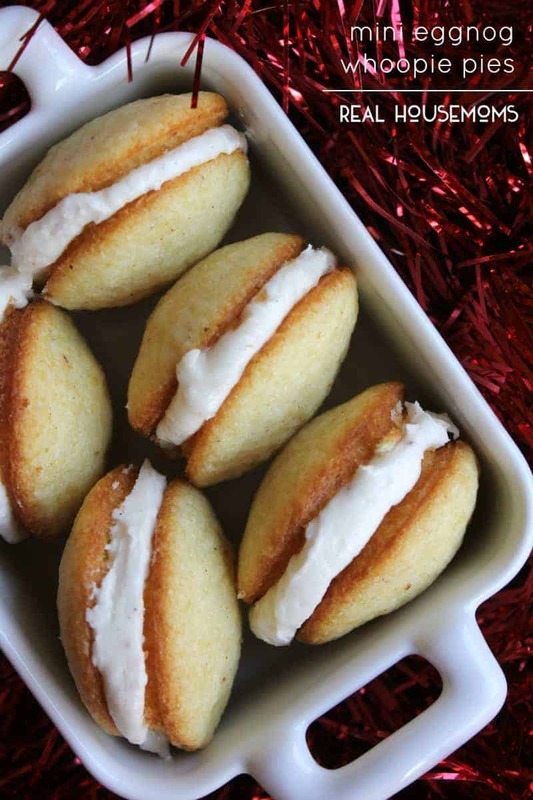 While I know eggnog isn’t everyone’s jam, these mini whoopie pies will totally change your mind if you’re not a fan. The mugmeg cake is fluffy and tender, and the eggnogg buttercream filling is good on just about everything! I’m talking spread some on your Cranberry Orange Bread & Red Velvet Cookies, or even sandwich some between Spiced Oatmeal Raisin Cookies! YUM! But these little whoopie pies remind be of being a kid again. Just be careful eating them. The filling squeezes out a little if you don’t eat ’em in one bite. 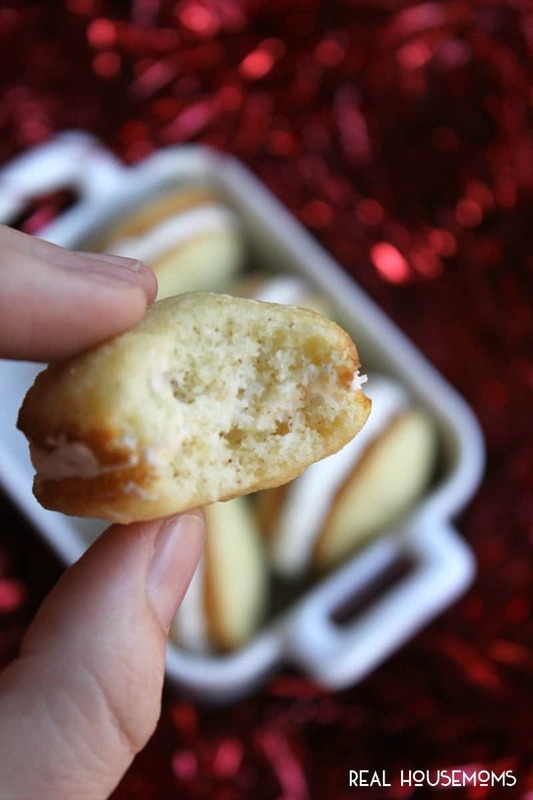 Preheat your oven to 350 degrees F. Lightly coat a mini whoopie pie pan with non-stick cooking spray. In a medium mixing bowl, stir together the flour, nutmeg, baking powder, baking soda, and salt. In a large mixing bowl, beat together the butter and sugar until pale and fluffy, 1 to 2 minutes. Add the eggs and mix to combine, scraping the bowl as needed. Add in half the flour mixture and mix to combine. Add in the eggnog and mix. Once the milk is just about incorporated, add the remaining flour mixture and mix until just combined. Portion level tablespoon full scoops of the batter into your prepared baking pan (working in batches). Bake for 10 to 12 minutes, or until the edges of the cakes are a light, golden brown. Remove from the oven and cool completely, about 20 to 30 minutes. Remove from the pan. In a large bowl, carefully beat together the butter, powdered sugar, rum, vanilla, and nutmeg until smooth. If the buttercream looks too thin for your liking, add a couple tablespoons of powdered sugar and mix. Repeat until the desired consistency is reached. Place half of the cakes, foot side/cut side up. Scoop about 1/2 tablespoon buttercream onto the exposed side of each cake. Take a second cake and place foot side/cut side down towards the filling and gently press down to spread the filling out to the edges. If you don't have this pan at home, you can pipe the cake batter onto a piece of parchement paper (on a cookie sheet) in 1-inch to 1 1/2-inch circles. Bake until the bottom edges are golden. Continue as directed. 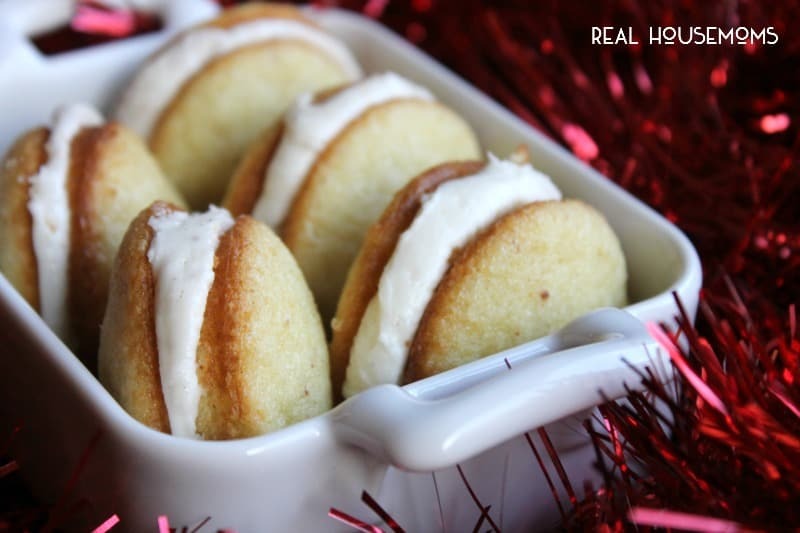 minim eggnog whoopie pies! Where i the eggnog? I made a double batch of these first try. It seemed to take me forever and by the time I was done my kitchen was trashed. My fault. I just got too ambitious and separated the dough and used red and green food coloring to make them festive. I made 5 different huge batches of Christmas cookies over the last few days and this was probably the most labor intensive of all of them. (Again, my fault) Please don’t mistake my comment as being super negative. The upside is that when I was finally finished and wanted nothing more to do with them, I ate one. Holy Moly! It was so delicious! 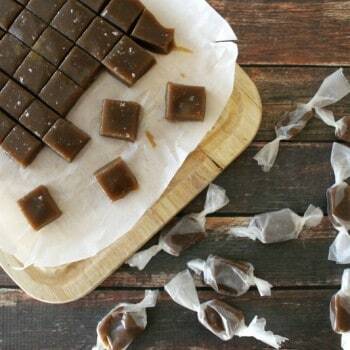 I will definitely make these again, but based on the time it took out of my night and the mess to clean up, I’ll either stick to once a year or abandon the food coloring. Thanks so much. The flavor of these are just perfect.